Very cute and unique place. The hosts were friendly and helpful. We very much enjoyed our stay. 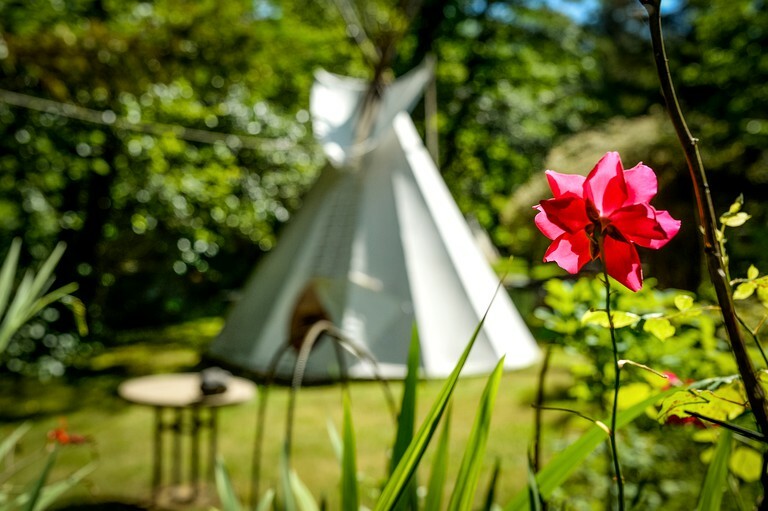 There are seven tipis in total, each of which can accommodate two guests, with the exception of the Crazy Horse Tipi, which can sleep up to eight guests. 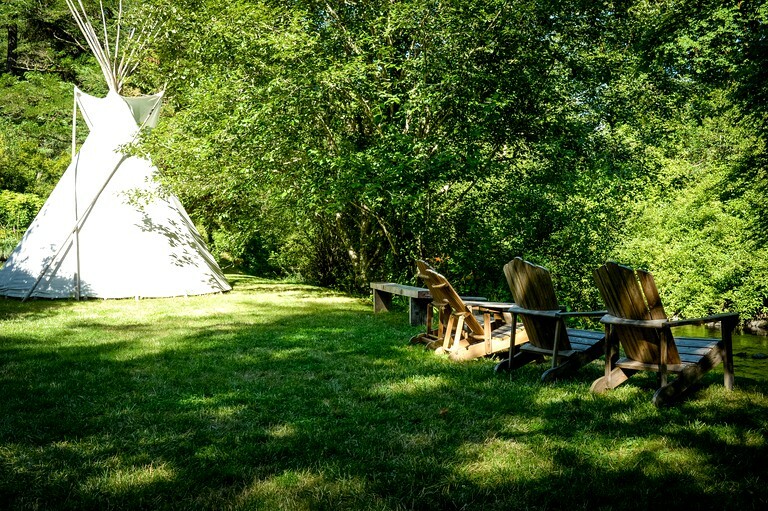 The tipis have beautiful stone floors with wool rugs, warm and comfy beds with cotton sheets, down comforters, and wool blankets for the cool Oregon summer nights, as well as an extra chair and side table. 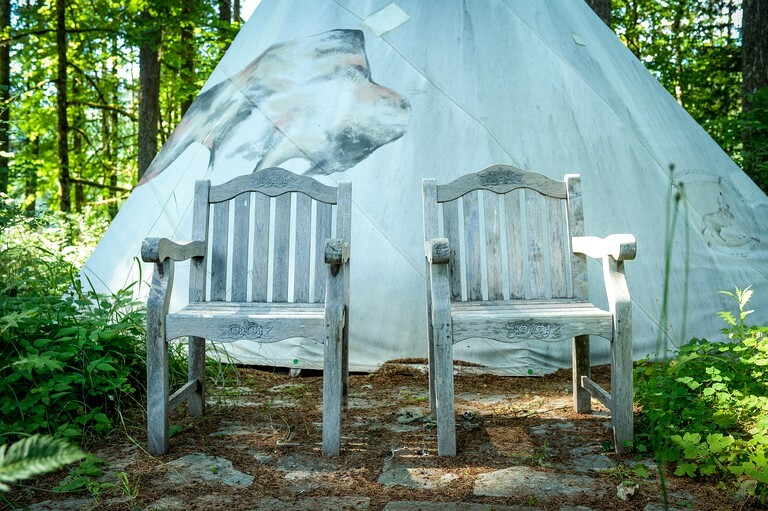 Though all of the forest tipis are connected by trails and are within sight of each other, there is plenty of space and privacy between them. The five forest tipis have electric lights, and the two tipis by the creek (Chief Seattle and Chief Joseph) are lit with candles and lanterns. Please read below for further descriptions on individual tipis. Chief Seattle Tipi: This is a beautifully painted 22-foot tipi depicting ravens flying over mountains. 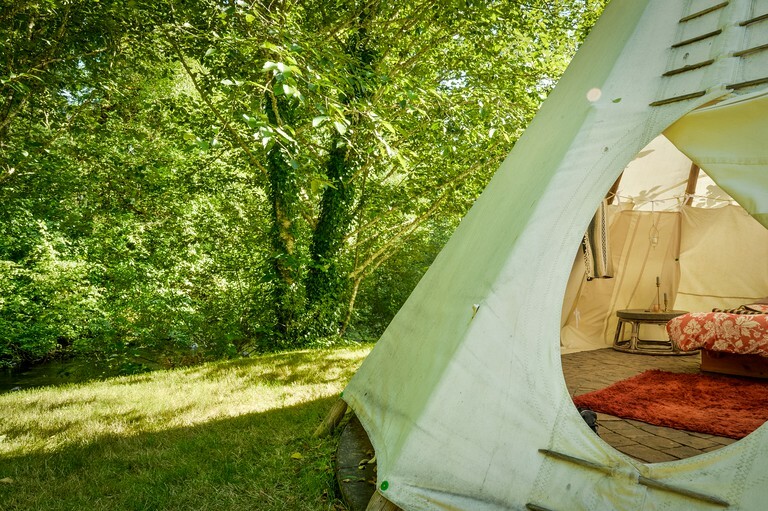 This tipi is perfect for a couple, or for a family with children who can sleep on two to three extra foam mats. 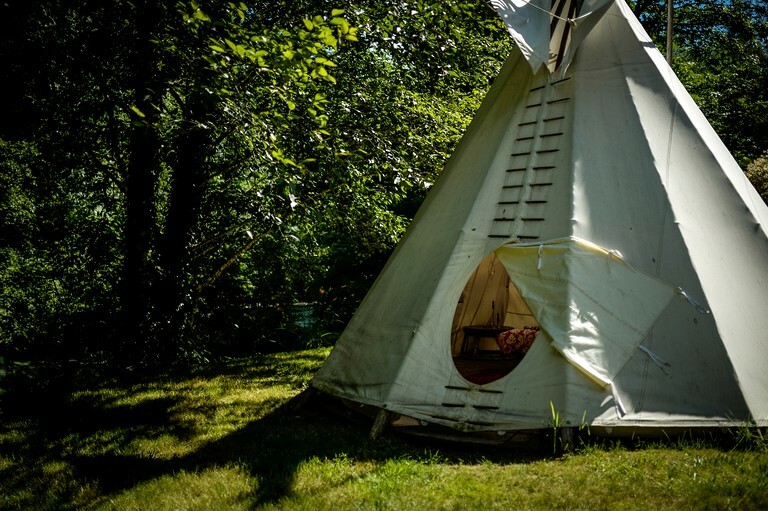 This tipi is located between the house and the creek, and it’s surrounded by beautiful birches and lawn. 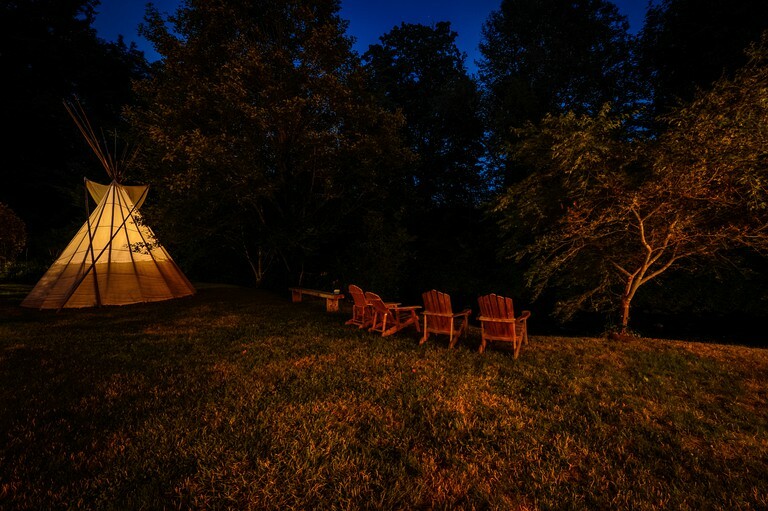 This is the only tipi with a fire pit in the center, and that’s precisely why it’s the site’s most popular tipi. Inside, glampers will find a full-sized bed with a comfortable goose-feather down comforter, which comes in quite handy during cool summer nights. This tipi is lit by candlelight, which gives it a warm, romantic glow. 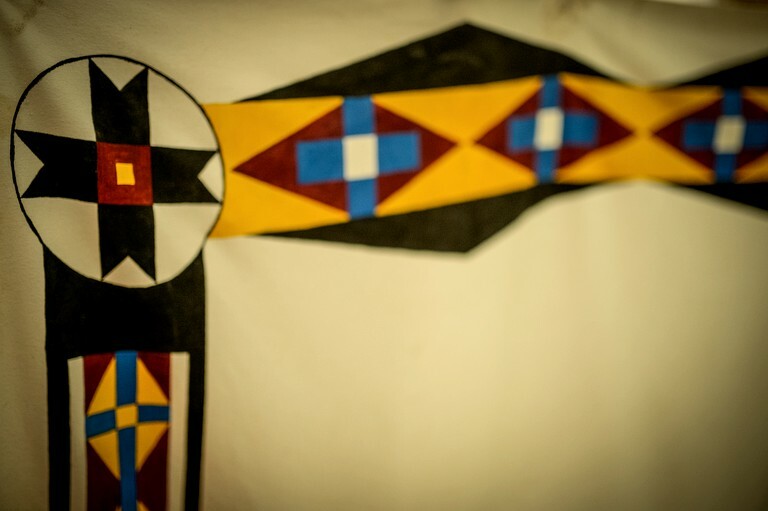 Chief Joseph Tipi: This beautiful tipi is located on a grassy area between the creek and the garden. 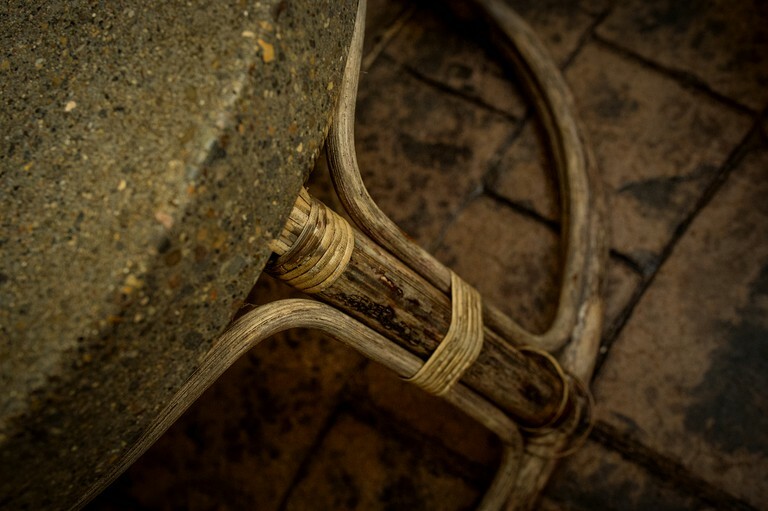 It boasts a stamped, concrete floor, and like all of the tipis, it’s decorated with rugs and wool blankets. 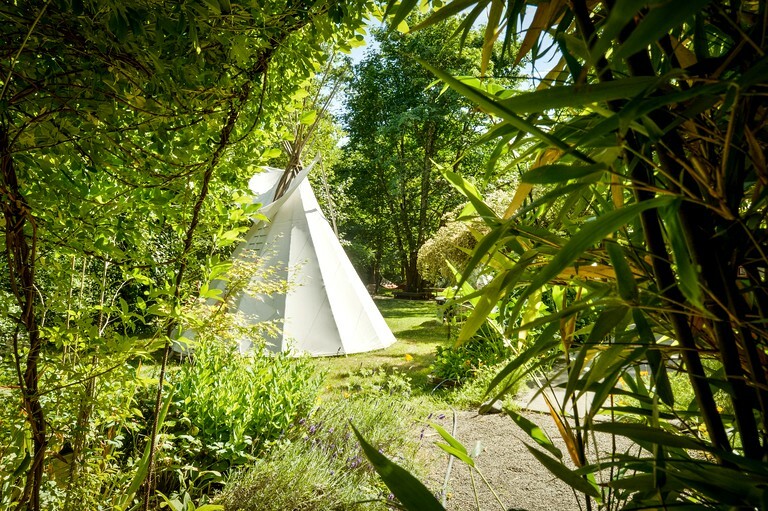 This tipi has a great location, as it’s right in the heart of all the activity. 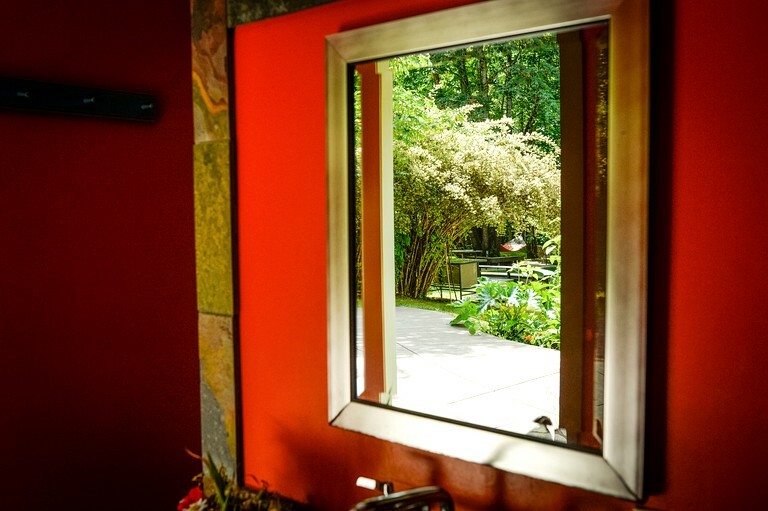 It’s close to the outdoor kitchen, the patio, as well as the bath house and spa. This beautiful tipi is lit by candlelight, which gives off a lovely, warm glow. 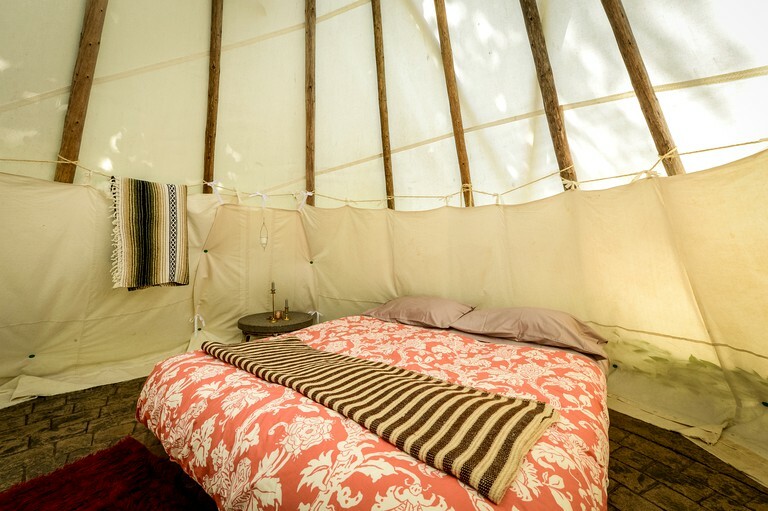 Inside the tipi, glampers will find a queen-size bed with a nice down comforter. This tipi is a great choice for parents with young children who want to stay close to everything. Glampers can fall asleep to the sound of the splashing creek, and wake up to the sound of chirping birds. 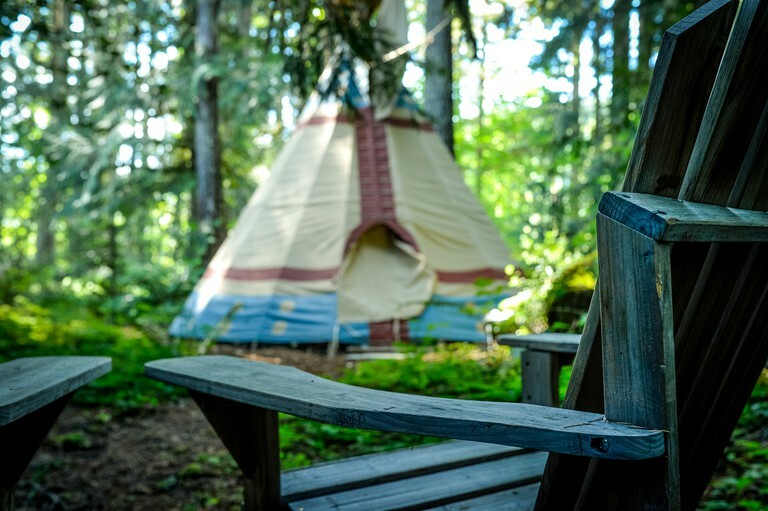 It’s the perfect tipi for a little getaway. Sitting Bull Tipi: This tipi, which is located in the middle of the site’s forest, is actually the first one the hosts built. 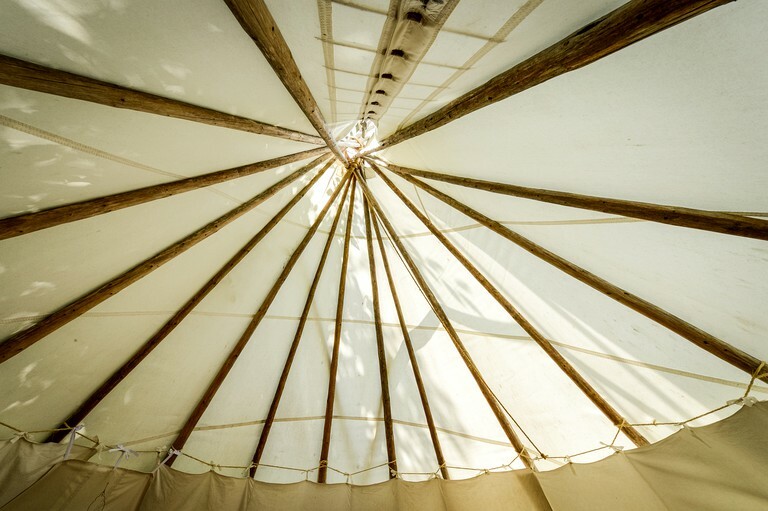 The tipi’s floor is made of Lakota limestone, and inside the tent glampers will find a cozy queen-size bed, a warm down comforter, and a beautiful buffalo hide atop the bed. 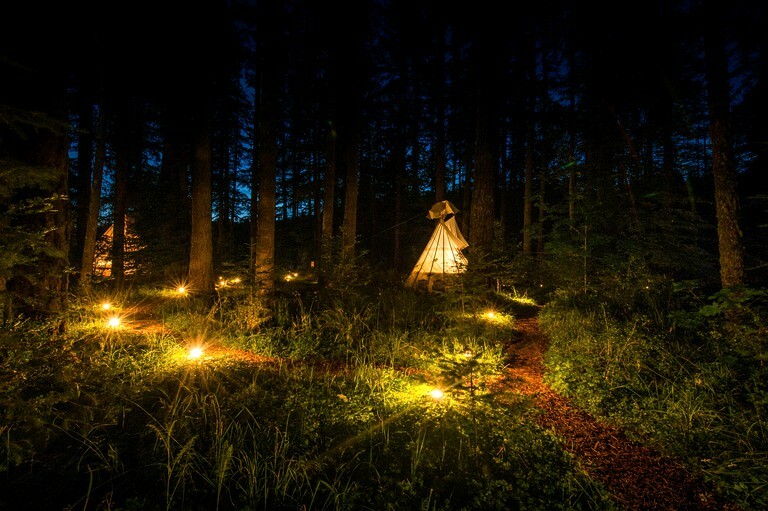 This tipi is lit by a bedside lamp as candles are not allowed in the forest. Crazy Horse Tipi: This is the site’s biggest tipi. 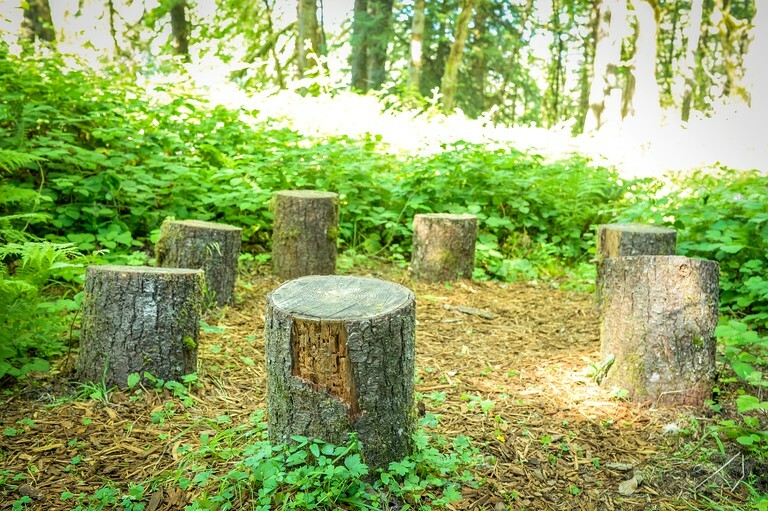 It measures 30 feet in diameter, and it is located in an area surrounded by Douglas firs. 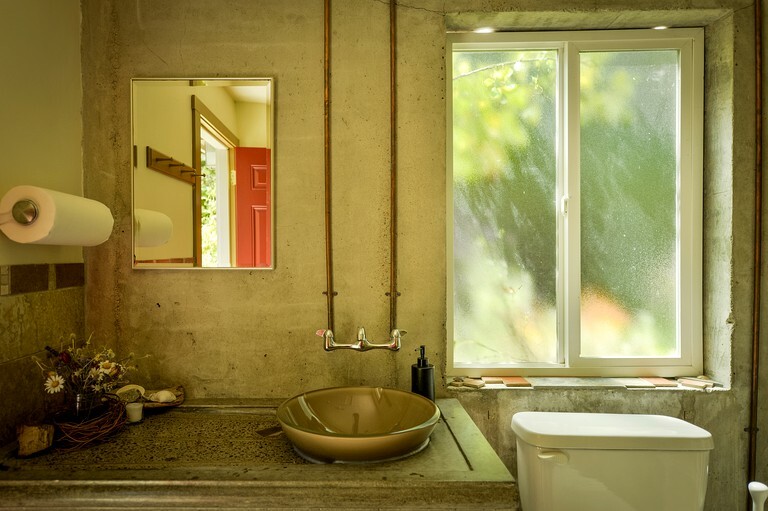 Inside, glampers will discover a world of rich colors and textures, as well as lots of warm, wool blankets and rugs. A string of little lights add to the cozy glow of the tipi. 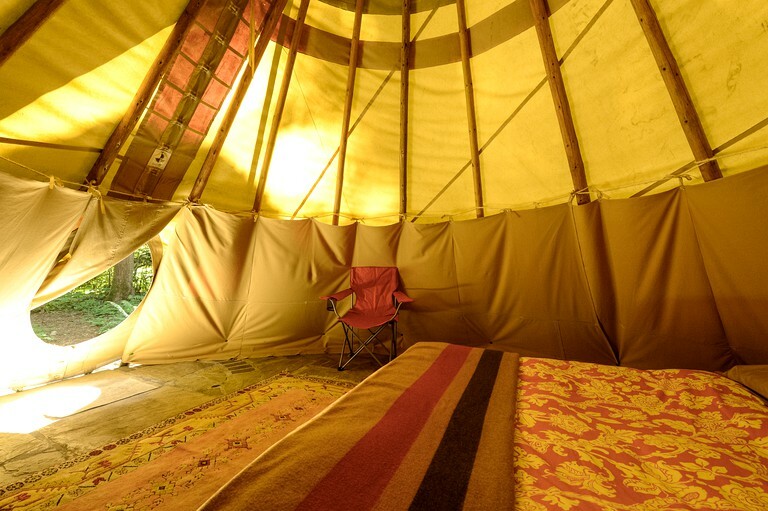 The tipi is equipped with two full-size beds, which both boast comforters, as well as four floor mats. 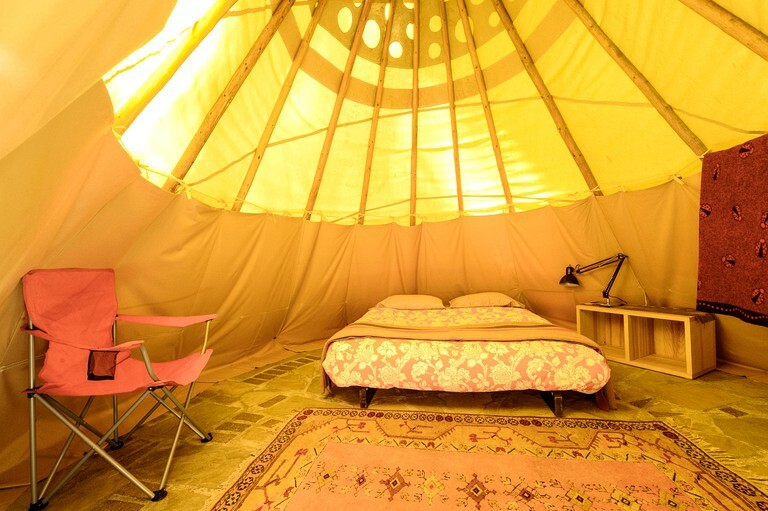 That means that this tipi can comfortably accommodate up to eight guests, and even up to 10 if there are children. Please do keep in mind that those sleeping on the floor mats should bring their own sleeping bags. Sacagawea Tipi: Located along the edge of the forest is the Sacagawea Tipi. 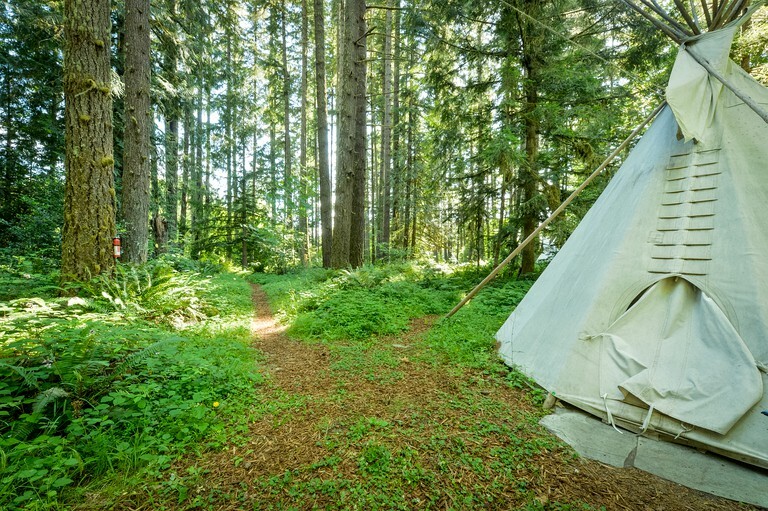 With cedar trees on one side and a beautiful, open field to the other, this is a beautiful forest tipi. 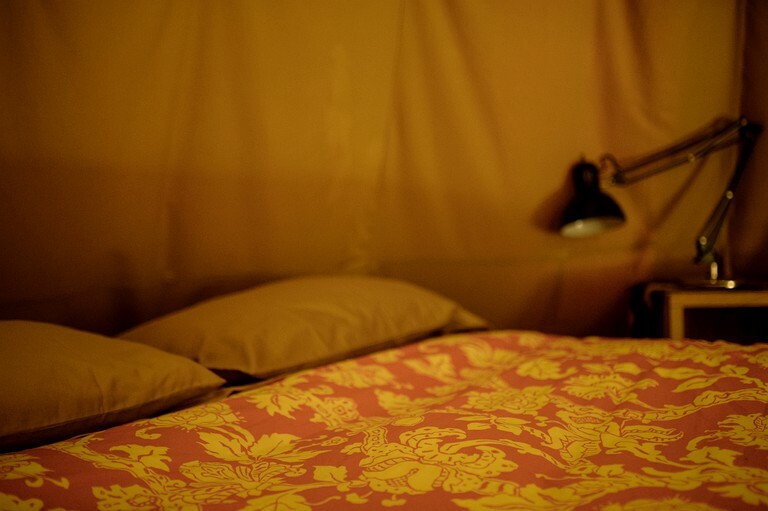 Inside, there is a stone floor with a wool rug, as well as queen-size bed fitted with a down comforter. Hiawatha Tipi: This tipi is located deep in the forest, though still in sight of the other forest tipis. 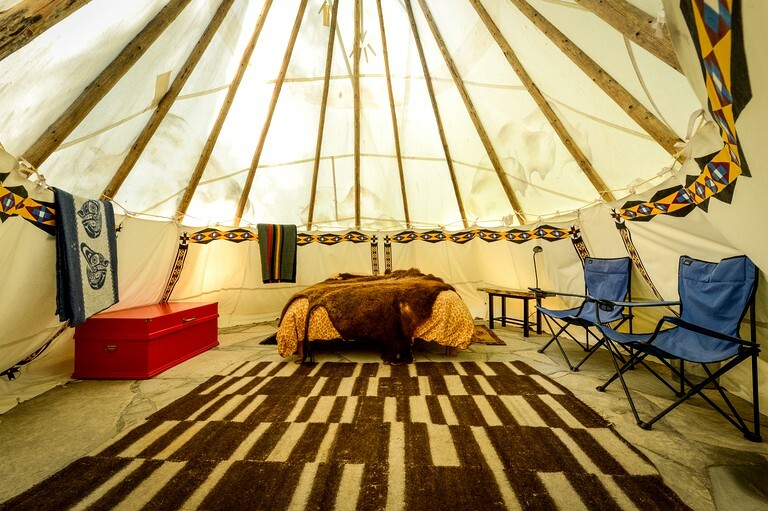 With a warm, vibrant interior of wool blankets and rug over stone floor, this tipi boasts electricity, and a queen-size bed with a down-comforter. 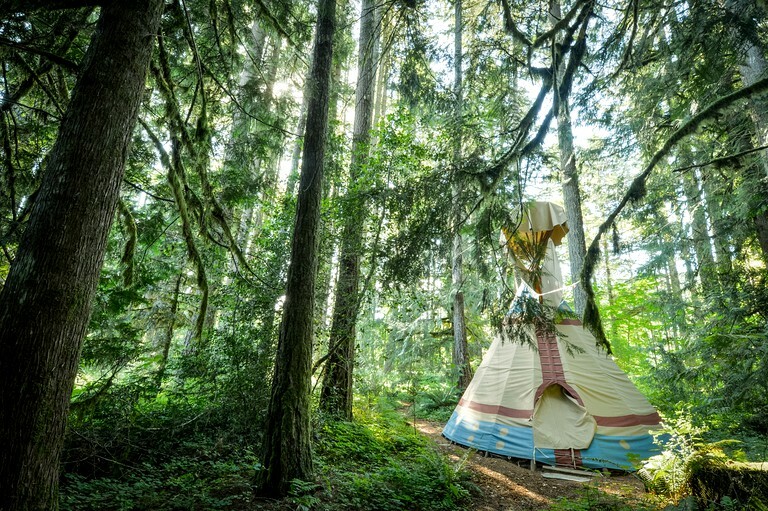 Calapooya Tipi: This forest tipi is sheltered beautifully by tall Cedar trees and located close enough to the creek to hear the water. 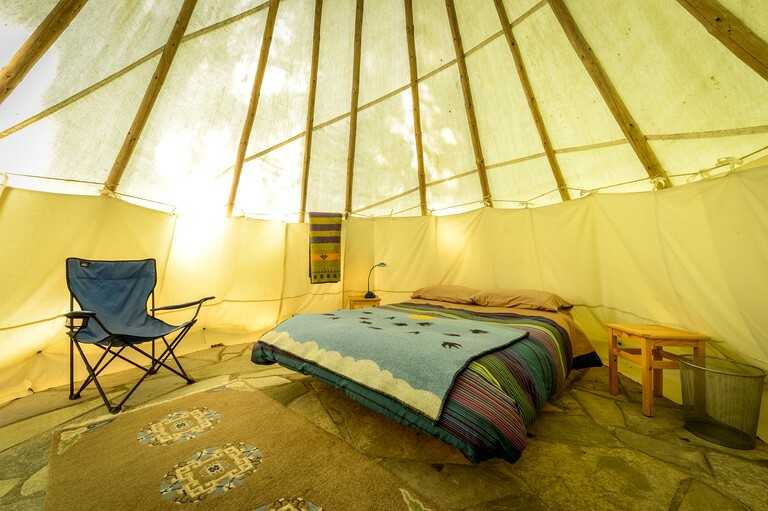 This is a painted tipi with a heavier canvas, and inside there is a stone floor, a queen-size bed with a comforter, and a bedside lamp that provides a warm glow. 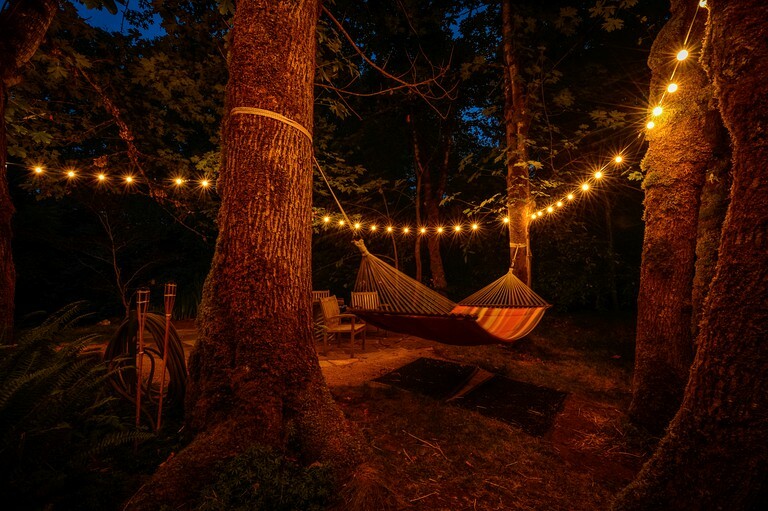 Some important site amenities include a pristine forest with hammocks to enjoy the forest sounds, a clear-blue, fresh water low flowing creek with a kiddie pool, a dining room, the nearby swimming hole, a group fire pit, a spacious hot tub, a parking lot, and a restaurant. 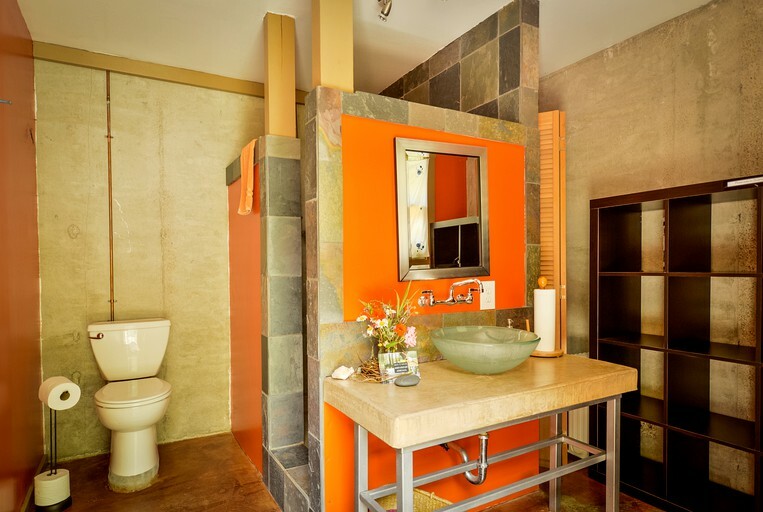 There is also a bath house with two full bathrooms that tipi guests share with cabin guests. 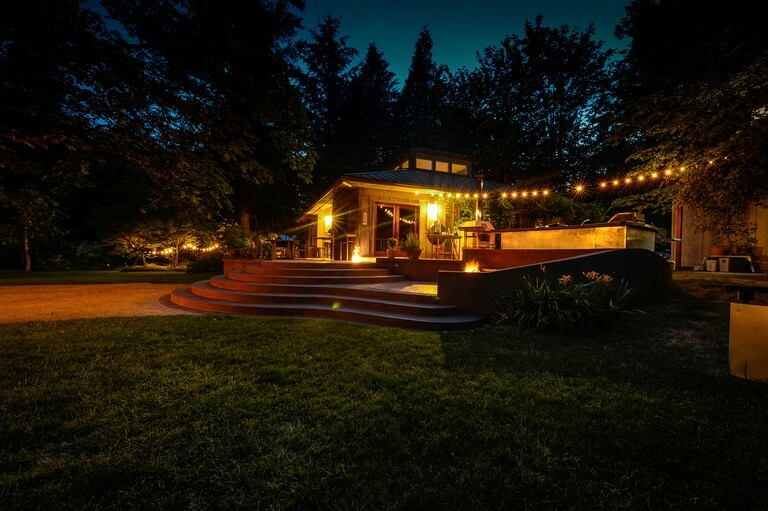 This glamping site in Oregon is a great place to host a big event, a reunion, or a wedding. 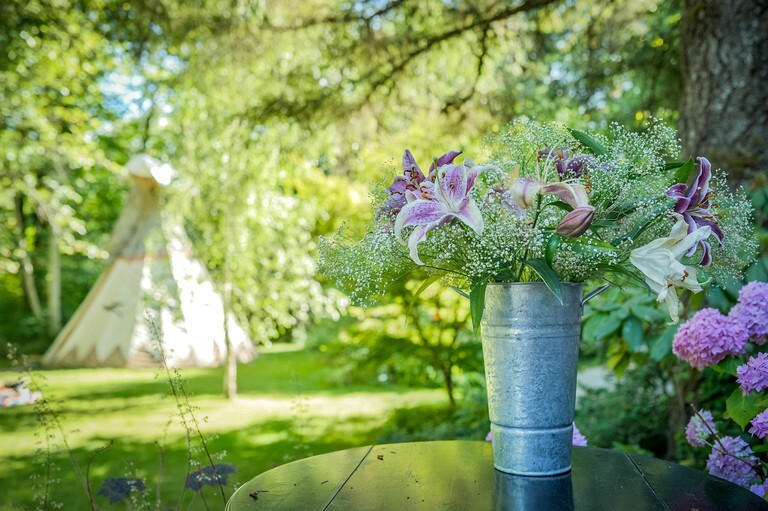 In addition to tipis, this glamping site also has cabins and rooms available, so guests are asked not to hesitate to contact the host if looking to book an event. This glamping site is a haven away from the ordinary. 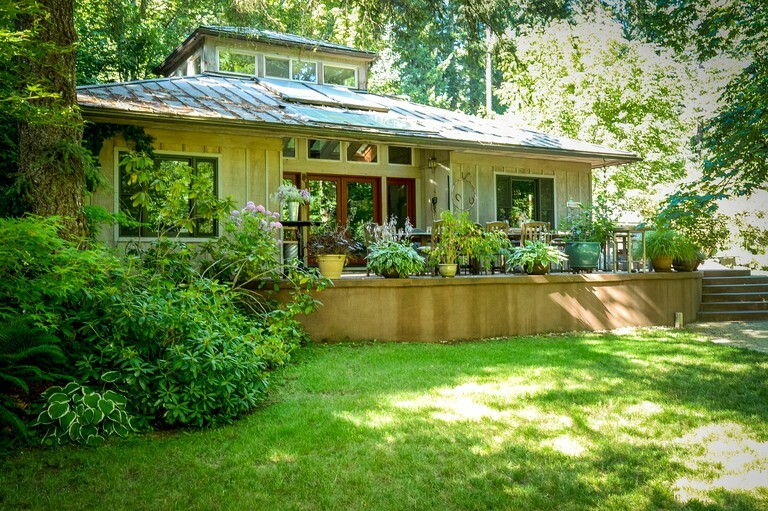 Located in the Mohawk Valley near Eugene, Oregon, it is perfectly positioned for adventure. 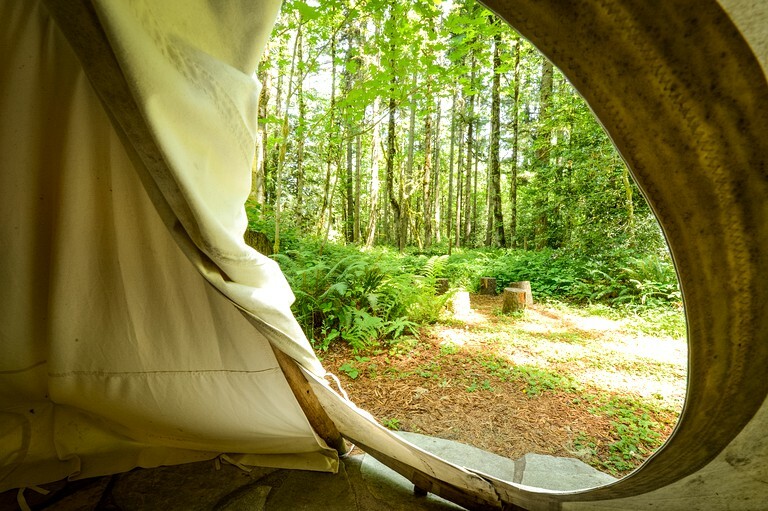 There are beautiful day trip destinations to the north, east, west, or south, and it’s up to glampers whether they travel by two or four wheels. 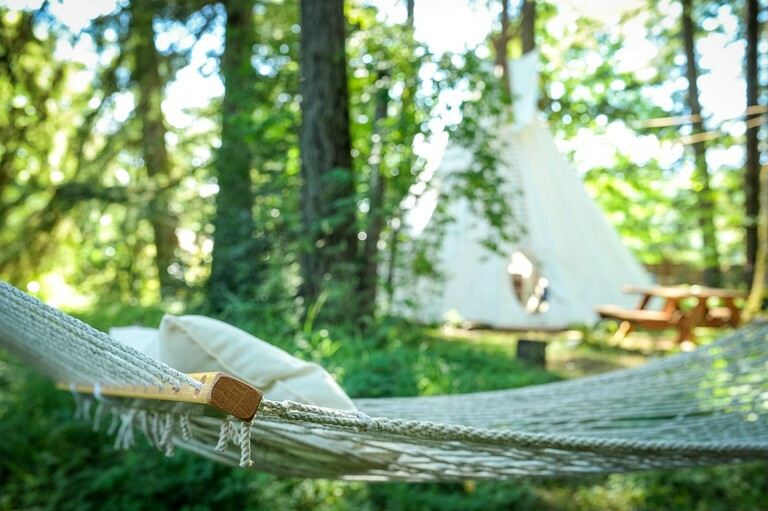 With its secluded woodland setting, its unusual collection of tipis, and its friendly hospitality, this Oregon glamping site provides an ideal setting for group retreats, family reunions, weddings, workshops, and other overnight events. 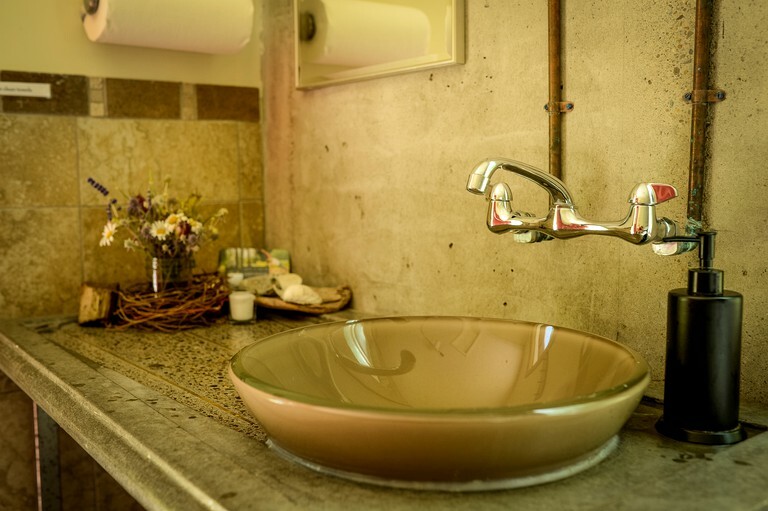 It is a happy place for children of all ages, as well as for the adventurous traveler wanting a unique lodging experience. Time takes on a different meaning out here. 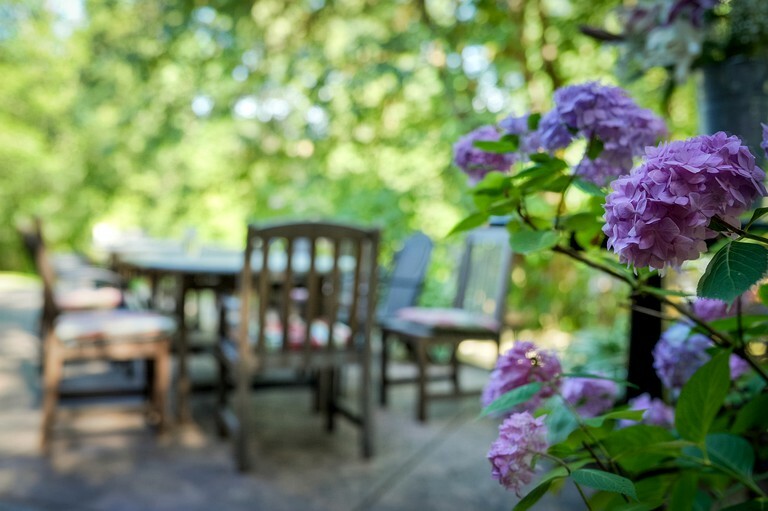 Guests will feel themselves relaxing into a slower pace—into the here and now of birds singing and water flowing. 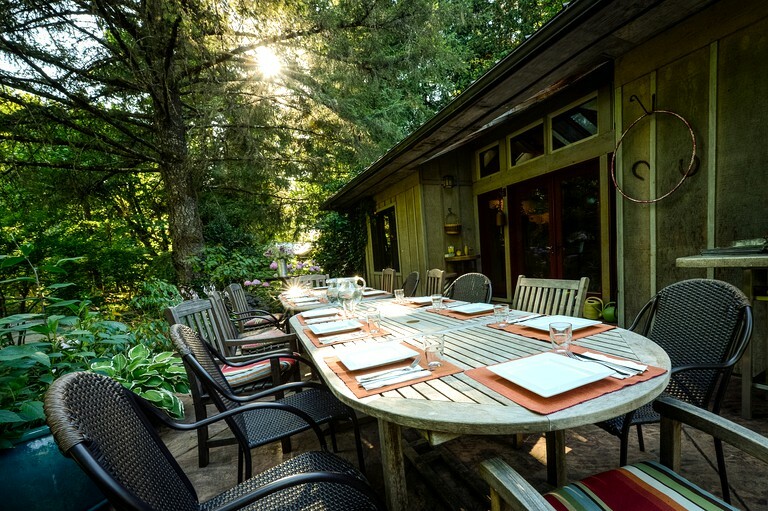 If guests sit still, they can observe the wild flock of quail, the occasional pheasant, or the wild turkeys and deer coming through on their daily routes. In the spring, it’s common to spot elk bulls grazing at the edge of the forest, and in the fall Oregon Chinook salmon swimming upstream in the creek. This is an amazing chance to experience nature’s silence and stillness. Glampers will find an atmosphere of respect within these tall trees. Guests can simply move into the village and focus on having fun with the kids. They can go treasure hunting in the creek, hike to the swimming holes, or even bring a book and read in one of the hammocks. 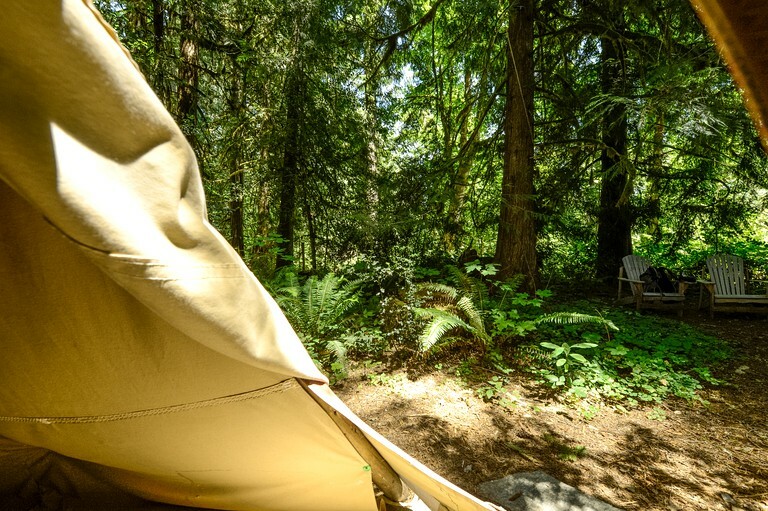 If guests are in search of adventure, there is hiking right on site or in the nearby Cascades, where glampers can hike a mile of the Pacific Crest Trail. 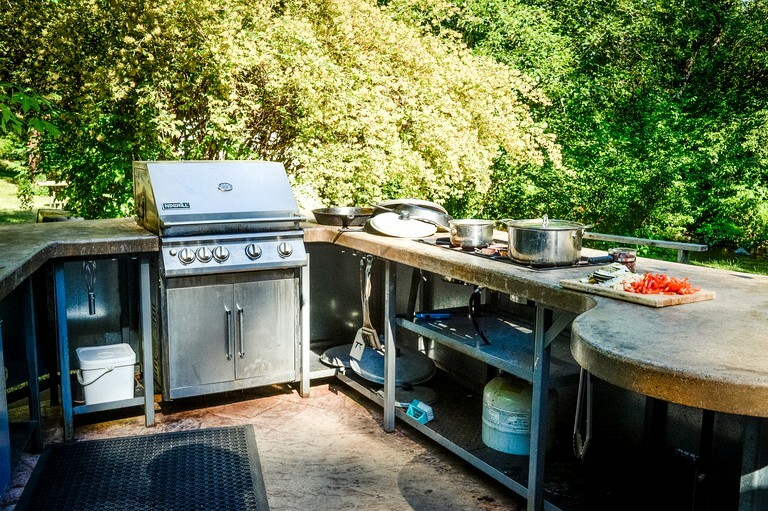 Other things glampers can enjoy include hot springs, whitewater rafting on the McKenzie River, wine and beer tasting in and around Eugene, and even some yoga retreats that take place on site. If interested in the yoga retreat details, please message the host. Eugene offers plenty of recreational sports. It boasts miles and miles of running and bike paths, as well as the Olympic Trials every four years. 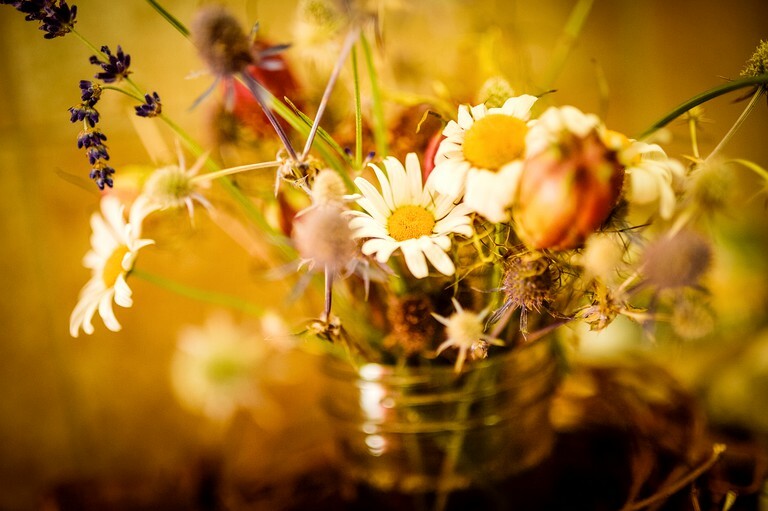 There is also a well-known Saturday Market and the Bach Festival in July. 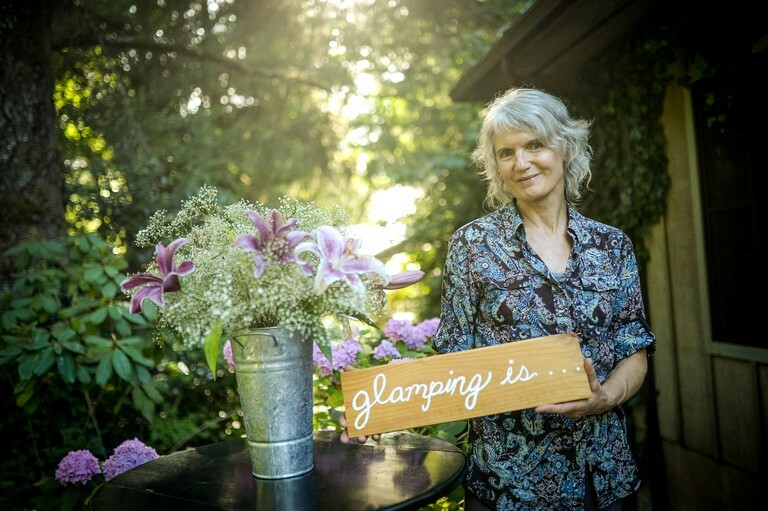 Glampers can also take advantage of the yearly Oregon Country Fair. The Oregon coast is just an hour and a half to the west, and the Cascade Mountain Range is just 45 minutes east. Portland, Oregon, is just two hours to the north, and Ashland is located to the south. Extra guests can be added to each dwelling for $45 per person (children from ages six to 12-years-old only pay $35 each). Children five and under are free. Guests must bring their own sleeping bags. There is a 25 percent, non-refundable deposit requested at the time of booking and will be individually arranged with the host. To accommodate all guests, as well as the site's neighbors and the county ordinance, quiet time begins at 10 pm. Amplified music is allowed until 10 p.m. and soft acoustic music until midnight. The hosts ask for silence after midnight. There is a no pet policy, due to the band of wild turkeys, the flock quail, the occasional pheasant, the hosts' chickens, and the "village dog," Chief Ollokot (Olli for short), on site. Please inquire with the hosts if glampers seek an exception to this rule.